We said goodbye to our beloved Rocky. He was with us for 10 months post amputation; active and enjoying life. We will love you forever Buddy Boy, fly high Rocket Man until we meet again. Thank you tripawds for all your support during this chapter of our lives. Ohhh no I’m so sorry to read this. My sincere condolences to you and his sibling, your hearts must be broken into pieces right now. We would be honored if at some point you felt like sharing more about your handsome boy. If you feel like adding images to this topic and celebrating his life with us, that would pawesome. If not, we understand. Healing takes time. Rocky knew how much he was loved, and his spirit will never leave your side. He was such a lucky cat to have you for his humans. Rocky is whole, and on four again I do believe they get that fourth leg back if they desire! Watch for signs I’m sure he will visit and let you know he is whole, happy & pain-free on the other side. I hope Sophie manages ok cats mourn just like humans do. It took Purrkins over a year to get over the loss of our senior kittie its gutwrenching for us all. I left our Garfield’s bed and toys out, and that seemed to help Purrkins find some comfort finding his smell when he needed to. We did bring Garfield’s body home for the boys to smell and acknowledge he had passed we read that it was helpful. It helped one kitty, not Purrkins. He didn’t seem to understand for whatever reason he continued to look and call out for his big brother. Give Sophie extra love and attention she will need if she was close to Rocky. May I ask what happened did cancer come back or was there another disease? Purrkins also had a soft tissue sarcoma on his wrist his was a low grade I remember Rocky also had a soft tissue sarcoma on his wrist. Please disregard if you wish not to answer. I whole heartily understand how hard this is. Thank you for taking the time to let us know. Run free Rocky come check in on your family to let them know you are ok. I am terribly sorry for your loss. I know it is so hard to say goodbye. Sophie will need lots of tlc, I went through similar as Holly did when we lost Gazoo. Sending you all hugs and wishes for comfort. Please feel free to come back and tell us more about your beautiful furbabies if you are able. It can be very therapeutic to talk about it and we will be there for you to lean on if you want. Again, I am so very sorry to hear that Rocky had to shed his earth clothes. I have no doubt though that he will be watching over his family. So very, very sorry ro hear Rocky had to head to the Bridge. We know your heart is broken and we know the void is so,painful right now. Rocky, sweet Rocky, touched us all. All kitties are special family members to us, but to have a senior who did so well as a tripawd…well…just a little “extra special”. Rocky’s story will inspire any kitty starting this journey, but especially our more “mature” ones. PS. The word good-bye” doesn’t even exist in some cultures. They use “til we meet again”. Thank you all so much for your kind words and your understanding that Rocky was our furbaby, a member of our family. It is wonderful to have this support group. I’ll update my Rocky Remembered tribute post when a bit more time has passed. In a nutshell Rocky had 6 months post amputation of fit and cancer free living. Then overnight his lymph system became massively swollen. Our vet thought it was likely lymphoma. We opted to keep him comfortable with steroids (which totally reduced the lymph swelling) and pain meds when needed. He did great for 3 months still active and being his sweet social self. Then the 4th month he started getting weaker and missing jumps, one evening he fell backwards off his “senior pet steps”… that was the beginning of the final days. Bless him, he still pushed thru to spend every day in the same room with us, he always wanted to be close. His final hours were spent laying next to me, thankfully my husband stayed home too as we knew this was really the end. Our son and daughter-in-law came to love on him for the last time. That evening our vet came to the house to help him across while my son held “his little brother”. Rocky is buried in the garden and this spring I will plant a memorial lilac bush or something as lovely. 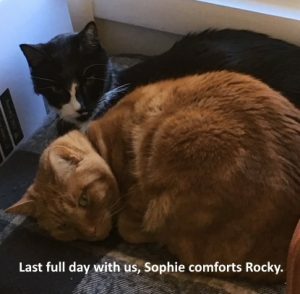 Sophie stayed very close to Rocky the last months, she knew. She sniffed his body but but I’m not sure she understood he was gone. Sophie has never been alone, except for the 2 nights Rocky was at UGA for the amputation. It seems she is still expecting him to come home, she is definitely grieving. We know she needs a companion and plan to adopt a kitty from the feral cat program (both of our cats were rescues). Laurie, thank you for sharing this with us, it’s an honor. Rocky was so loved by the entire family, what a very special guy. You were there for him 24/7, right up to the end. As heartbreaking as his loss is, an animal cannot ask for a more beautiful, loving way to transition. All the love and great care you gave him helped him live his last months with dignity, there’s no doubt he fearlessly left this earth knowing that he mattered. I wish all animals could have the same gift. Poor Sophie. I hope she is able to manage the heartache so that when you find that perfect companion for her it’s a beautiful match. Yeah, animals definitely grieve. Hold her close and give her extra scritches from all of us. Thanks for sharing Laurie I know it’s not easy, and we are so sorry about the lymphoma! Cancer plays so dirty and has zero rules! So unfair. Coincidence this was on my news feed today I don’t believe in coincidences. Purrkins did the same as Sophie it did not register to him, or it did he didn’t accept it and when they are close like that it makes sense they mourn as we do. Give Sophie some time before adding in a new member to the family allow her to grieve and get back to feeling like herself and follow the guidelines for introducing new cats to ensure a smooth transition for them both. Let us know when you do please. HUGS & scratches and smooches to Sophie! Holly that article is a good one! Sophie does love her routines. One of the things we are using is a product called Quiet Moments (NaturVet). It is a pheromone room spray that our vet recommended for Rocky on his trips to UGA (he hated leaving the house). Now I use it with Sophie and diffuse it as well, what a difference it has made. Rocky passed 2 weeks ago today, after about a week of using Quiet Moments we saw an improvement with Sophie. She still makes the rounds looking for Rocky, but she is now eating normally and starting to play again. Thank you Laurie for sharing your story. Beautiful pictures of your babies. Angel Rocky has such a handsome and unique face, reminds me a little of my Angel Gazoo. I am so glad you are finding a way to nurture sweet Sophie. They really go through a harder time than most people will give them credit for. When we lost Gazoo I was heartbroken. I just felt lost. We went to PetSmart and they were having an adoption day. I really hadn’t planned on taking in another kitty yet, and at the same time everything was just so quiet and lonely. Andy was returned twice to the shelter. I don’t know if they were trying to tug at my heart strings but they said he had a hard time getting along with the other cats in the household. He looked like the Sta Puffed Marshmallow man, lol. And he was so sad and lonely looking lost himself in that cage. My husband fell in love with him and we ended up taking him home. Not 2 weeks later was when I helped grab Oscar.. a five week old feral that was born on the grounds of the VA hospital that I work at. After we caught the hissing screaming mess I popped him into a box and called my husband. He came to the office and I asked him to put the box in our half bath and just leave it be, lol. Long story shorter, Andy ended up being papa bear to Oscar. He groomed him, played dead while Oscar did his best to outplay him, and gave him the nurturing that he needed to grow and flourish. A year later Huck came into the picture and Andy befriended him also and still takes care of him. Andy is still very quiet and shy, but he has this huge strong heart inside of him that just overflows with love. I love the fact that you will take in another furbaby in need. Nothing will ever take the place of your handsome Rocky, but Rocky will help you when the time comes. 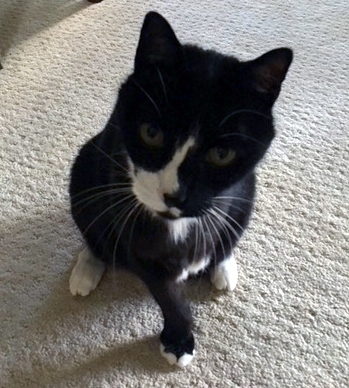 I believe with all of my heart that Angel Gazoo is sitting over the bridge slapping his paw on his thigh and smiling at all the love he sent to us. Thank you so much for sharing these wonderful photos. They truly are sacred treasures. I just love that face! And Rocky certainly showed off the perfect tripawd position when sitting. That front leg is perfectly centered. As everyone has said in one form or another, no one could have done more than you have for Rocky. And Rocky knee you would give him the gift of release when he needed it. You were so perfectly tuned into him and ALWAYS had his best interest at heart. Rocky will connect with you, and woith Sophie too, so pay attention. Glad to hear Sophie is eating normal and starting to play that’s fantastic. I have not heard of Quit Moments but have used pheromone sprays and diffusers. She is making good pawgress already considering its just been 2 weeks. I know watching them look and call for the other is heartbreaking. I agree with Jackie’s comments kitties do not get the credit they deserve in all aspects cats are very sensitive souls and sadly misunderstood by many. Rocky was such a handsome kitty & his eyes speak volumes. 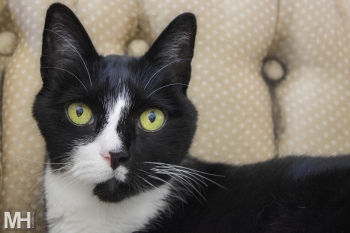 No one would have guessed he was a senior kitty in these photos. I apologize for not commenting on the pictures yesterday I meant to and meant to comment on his new avatar picture before that. I was taken back Rocky earned his wings originally and so saddened to read about the lymphoma & fall next. Rocky & Sophie remind me of our Purrkins and Saxton who are littermates and also rescues your post hits close to home. And with Sophie losing Rocky it brings up lots of memories I got derailed. I think its great you started a blog and can share his story in time. He is an inspiration for senior kitties! You gave Rocky the ultimate gift setting him free at home surround by love & his family. That is what we hope & pray for all our furmily members. No suffering and a peaceful transition at home to the other side. I also ditto Sally’s comment we NEVER say goodbye. We WILL see you later because it is my belief we will be reunited again with our furmily and family never to be separated again. I am sorry to hear of Rocky’s journey coming to an end. Run free sweet Rocky until you meet your family again.